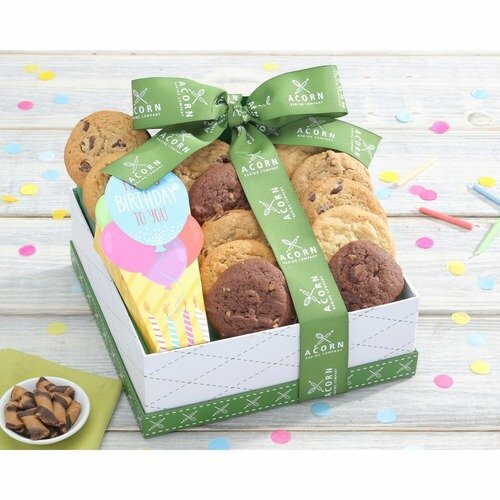 Wish another sweet year to someone dear by sending this assortment of delicious fresh baked cookies. They will be delighted to find a dozen fresh baked cookies from Acorn Baking Company. Classic flavors include chocolate chip, peanut butter and oatmeal cinnamon raisin cookies. 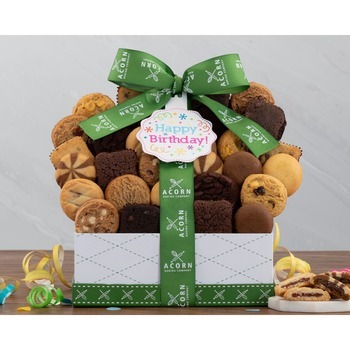 Dolcetto chocolate wafer bites inside a delightful "Happy Birthday" salutation box and colorful Happy Birthday hang tag complete this festive gift basket. * Before I made order on-line, I called a few florists, and the florist from 1st In Flowers is the most friendly and knowledgeable about the product. He suggested that I can view the arrangement on the web site and order on-line which will also give me some savings. Your web site is also user friendly, so we ended up ordering from you after calling about 6 florists. * Thought it was a great experience, quick and easy. Very affordable too!